photo caption: BMW Motorrad GoldBet SBK Team Rider Marco Melandri #33 (ITA) riding the BMW S 1000 RR. Istanbul – Qualifying Practice 2 & Superpole. Weather conditions: Rain in the morning, sunny in the afternoon. 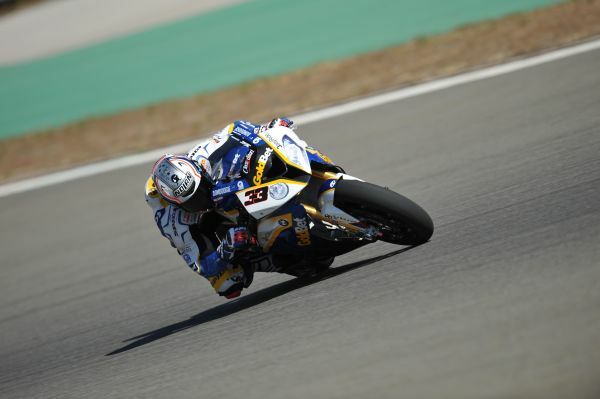 It was not a particularly easy Saturday for the BMW Motorrad GoldBet SBK Team at “Intercity Istanbul Park” (TUR). Due to the weather conditions the track action was mainly reduced to the Superpole qualifying in the afternoon, causing a loss of precious track time for the squad. Factory riders Marco Melandri (ITA) and Chaz Davies (GBR) will start tomorrow’s first ever Superbike races on Turkish soil from seventh and eighth on the third row respectively. The “Intercity Istanbul Park” hosts the 11th round of the 2013 FIM Superbike World Championship. It was raining during this morning's second qualifying practice and Marco and Chaz opted not to go out on track along with many other riders. For the free practice at midday, the rain had stopped but conditions were still wet. The BMW duo spent most of the session in the garage waiting for the surface to dry and only went out on track shortly on their BMW S 1000 RRs. In the afternoon, it was sunny again and Superpole started with dry conditions. Both Marco and Chaz did their first outing on race tyres. Chaz’ lap time was good enough to bring him into Superpole 2 and he returned to the garage after a couple more flying laps. Marco was on course to set the fastest time on his first lap but crashed in the final sector. He re-joined and rode back to the pits. With six minutes to go, he started a second attempt, again on race tyres. He set the second fastest time of the session and progressed to Superpole 2. In the next session, it took Marco one outing on race tyres to qualify for the final and deciding session. Chaz went out twice, once on race tyres and then on qualifying tyres to reach Superpole 3. In the final session, Marco put in his first qualifying tyre but he returned to the pits immediately to change to his second. With this, he set the seventh fastest time. Chaz only went out with five minutes to go, using his second qualifying tyre. But he had a sensor failure and qualified eighth, only a few thousandths of a second behind Marco. “I expected a better result because on race tyres we were quite fast, on a single flying lap as well, as we saw in Superpole 1. But we were not able to improve the time with the qualifying tyres because as soon as we put those on the bike became difficult to ride. I am looking forward to tomorrow in a positive way. “This afternoon we finally got some dry weather but unfortunately we did not seem to have a lot of luck. In the first Superpole, I struggled with the grip of the rear tyre. We made some changes and chose a different tyre in Superpole 2 and it was much better. But in Superpole 3 I immediately felt that there was an issue. There was a sensor failure in the shifting system and I had to use the clutch again. That did not allow me to push as I wanted to so unfortunately we are eighth on the grid. We definitely did not show our potential and I think we were capable of front row or maybe just the sharp end of the second row. Serafino Foti (Sport Director BMW Motorrad GoldBet SBK Team): “We are not satisfied with today’s Superpole. We expected a better result, consistent with what we had shown in the other qualifying sessions. Unfortunately with Marco we were not able to make best use of the qualifying tyres, while Chaz had bad luck with a sensor and could not improve his lap time. The results penalise us a bit. Tomorrow we will start from the third row and this does not help our riders. Anyway, we are quite confident for tomorrow’s races. Both our riders were quite fast with race tyres and the races will be long and difficult for everyone. Andrea Dosoli (Technical Director BMW Motorrad GoldBet SBK Team): “Honestly we cannot be satisfied with today as we could not work as we had planned due to the bad weather conditions. We could not evaluate the changes to the settings and we could not properly test the tyres to select which one we will use in the race. Also, we are not happy with the Superpole. Chaz had a sensor issue which slowed his performance a bit and Marco had quite a lot of vibrations with the qualifying tyre so he could not improve compared to his best lap time with the race tyre.